Too often when policy makers in Washington make bad decisions, the people of Kampala, Port au Prince, and Bogotá pay the price. This is exactly what will happen in Colombia if Congress approves the U.S.-Colombia Free Trade Agreement. AJWS’s partners in Colombia work on a wide range of issues—from securing resource rights for indigenous people, to creating new agricultural systems for community development, to empowering marginalized youth. 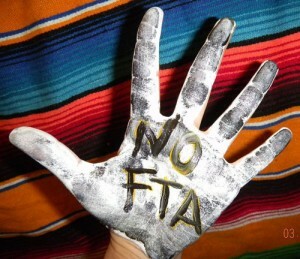 One thing that ALL of our partners have in common is that they oppose the Colombia Free Trade Agreement (FTA). So, what’s the FTA all about? It’s pretty disastrous. If the agreement passes, it could devastate Colombian populations that are acutely vulnerable—small-scale farmers making significantly below the minimum wage, indigenous and Afro-Colombian communities that have been marginalized for centuries and labor unionists defending basic human rights. Small-scale farmers. Already, most Colombian small farmers make less than the minimum wage. If the FTA passes, economists predict a flood of subsidized American crops will destroy the livelihoods of Colombian farmers who grow a vast array of food products, including corn, legumes and chicken. Prices and production of beans, for example, would drop as much as 54 percent. The result? Hundreds of thousands of Colombian farmers driven out of the market. Indigenous and Afro-Colombian communities. For years, indigenous and Afro-Colombian communities have been taken advantage of by multinational corporations that unlawfully seize their lands and systematically refuse to offer fair contracts with benefits and guarantees for local economic development and environmental protection. The agreement opens the door for corporations to sue Colombia in closed door international trade tribunals for public interest actions that could endanger profit margins, even if they include laws to protect citizens from toxic residue in drinking water and land permit denials to avoid displacing indigenous populations. Labor unionists and human rights defenders. Many Colombian workers are routinely denied the labor rights that we take for granted: sick days, safety standards and a living wage, to name a few. Colombia promised to end these practices as a condition for the FTA, yet abusive labor practices continue. Past history has shown that while supporters insist that these free trade deals improve labor rights, this is not the case on the ground. At the root of many of these labor problems are multinational corporations that come to Colombia and exploit workers, often with the consent of the Colombian government. Many multinational corporations deny workers their basic human rights, even hiring paramilitaries to assassinate bothersome union leaders. In fact, Colombia is the most dangerous place in the world to be a unionist. In 2010, 51 trade unionists in Colombia were murdered. That is more than every single trade unionist murdered in all other countries combined. Even worse, in 94 percent of cases, there were NO convictions. This number highlights a truly remarkable degree of impunity in Colombia. Human rights defenders are scared for their lives. The United States has urged change, but instead of reform, we see hollow proclamations that lack enforcement. Signing free trade agreements is, in effect, rewarding countries that flaunt the rule of law and condone assassination. This is not a way to create change, and is not a policy our leaders should pursue. We know these concerns are not hypothetical because for the past decade, AJWS’s partners in El Salvador have been fighting the Pacific Rim Mining Corporation, trying to prevent them from opening a plant that would contaminate surrounding water and soil with cyanide. Despite winning the support of their own government, Salvadorian activists fear that their government’s decision will be repudiated by an international trade court for denying Pacific Rim’s “expected profit”, thus violating the investment terms of the Central American Free Trade Agreement (CAFTA). Knowing that they can sue governments in this way will only give bad corporate actors an even greater ability to wreak further havoc in Colombia. U.S. trade deals should support our partners, not undermine them. But the Colombia FTA would devastate small farmers, and reward corporate greed at the expense of the most vulnerable populations. Support our Colombian partners by asking your congressional representative to vote against the U.S.-Colombia Free Trade Agreement. Samuel Datlof is an intern for the advocacy department at AJWS. He studies International Relations, Economics and Hispanic Studies at Brandeis University.